This week's list is a bit longer than we've seen for the last few weeks. It is however the holidays, when special beers tend to get pulled out and like a kid on Christmas we're thrilled to have shared these gifts-in-a-glass with our Beer Santa friends. The first two, both 2015 vintages of the FiftyFifty Eclipse series, were shared at a Festivus gathering. 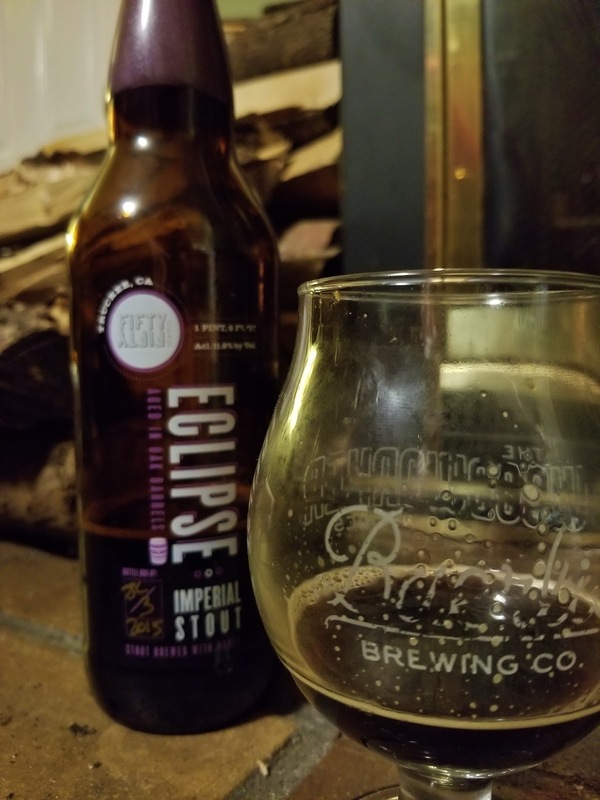 Eclipse Coffee - A wonderfully complex version of this 11.9% imperial stout starts off full of coffee, then transitions the barrel characteristics making themselves known, finally finishing with cocoa-y goodness. Eclipse Grand Cru - This version was heavy on the cocoa throughout in the most wonderful, smooth way and was the crowd favorite of the variations opened that night. Even with the high ABV it was very drinkable, to the point that it was tempting to steal off to a corner with the bottle. 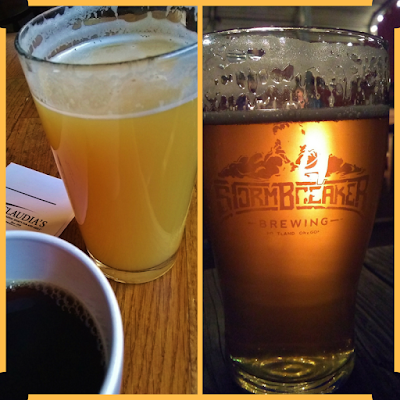 The next set of beers on this week's list were shared at our local which is perennially filled with generous souls. 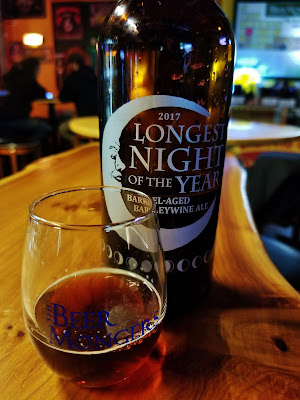 McMenamins Longest Night of the Year 2017 - Enjoyed, appropriately, on the longest night of the year, this barrel-aged English Barleywine was incredibly smooth. Not hot in anyway, even at nearly 11%, it was good enough that we'd encourage you, even those of you that aren't barleywine fans generally, to grab a bottle if you can find one. 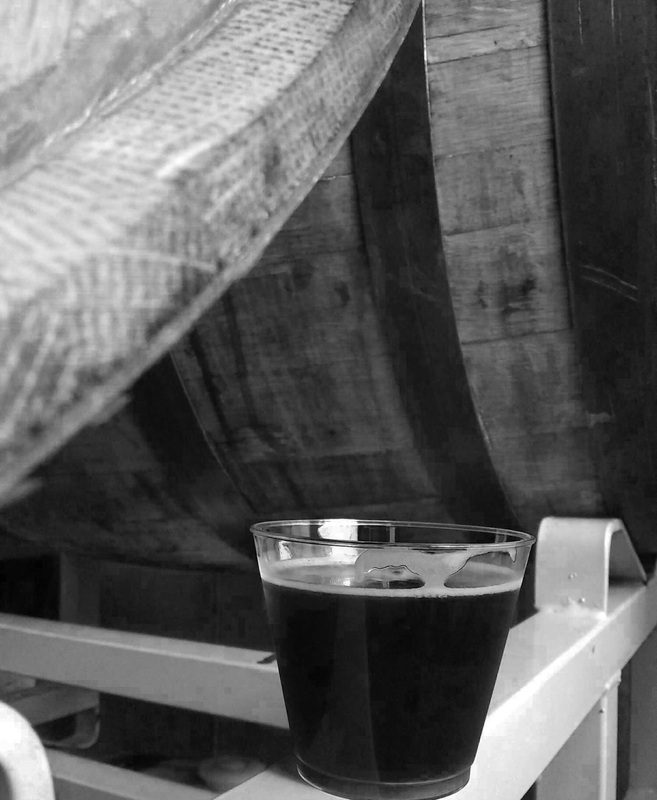 Like many of the other one-offs from the McMenamins' stable, it showcases the talent and skill their brewers possess. Beachwood Blendery Earthbound Misfit - Switching gears to the lighter side, this fruit lambic didn't appear to display much flavor from the kumquats but was nonetheless delicious. Primarily tart in aroma and flavor with a fun effervescence, the use of rye in the brew and time in oak barrels balanced the sourness. Jester King Omniscience & Proselytism (Blend 2) - Continuing on the sour path, this oak-aged beer that also spent time in a foudre with hundreds of pounds of Oregon strawberries tastes like summer. The wild yeast and bacteria allowed for refermentation, producing a dry, tart beer. This next beer wasn't new to us by any means but stands out for the fact that it was consumed twice, days apart, at different venues. Boneyard Incredible Pulp - As much as we enjoy RPM, we hope that this mimosa-like beer will gain an even greater following. Unlike some beers, each time we've had it we enjoy it just as much as the last time. 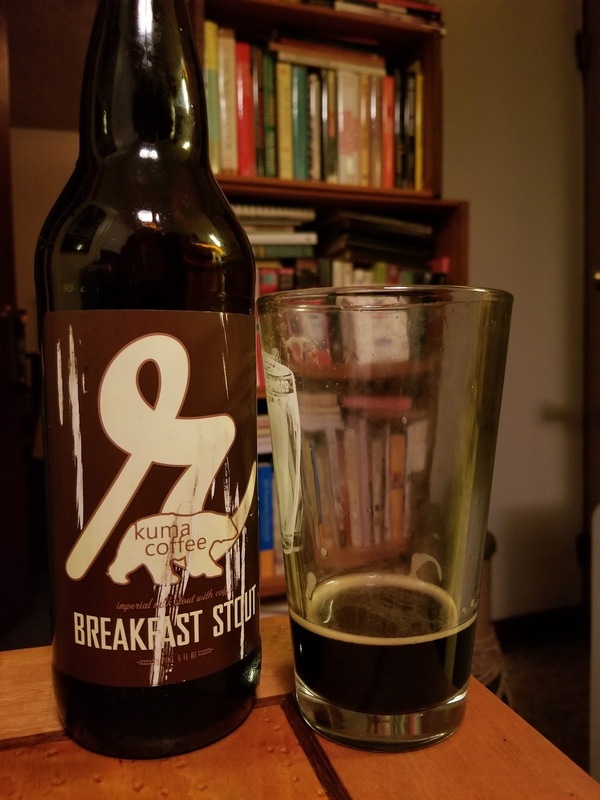 Reuben's Breakfast Stout - A very tasty milk/sweet stout with coffee, even at 8.4% it would be easy to imagine drinking this in the morning. As we head into what may be the longest night for many of us, we hope that however you choose to ring in the new year you are surrounded by friends, family and fabulous libations. This week's best were a split decision between cider and beer, with all of the makers being relatively new to us. Starting off on the beer side we had two more beers from Revision Brewing Company out of Sparks, NV. The first beer we had from them was a triple IPA and made The List in early November. 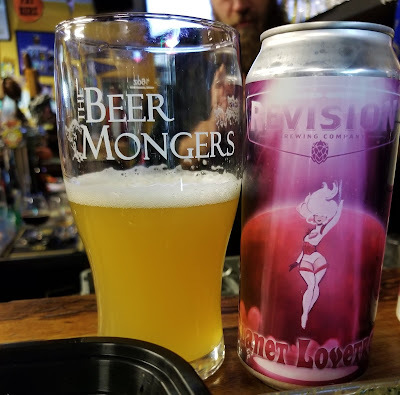 Planet Lovetron - The label artwork has a fun (albeit perhaps sexist) pink/lilac theme that jives with the slightly hazy, mildly fruity New England style IPA contained inside. The combination of Amarillo, Mosaic and Citra hops and "pillowy bed of malted goodness" hit our taste buds just right, in line with its 4+ rating on Untappd. The Bruff - Once again featuring one of our favorite combination of hops (Citra and Mosaic), this 8% New England style IPA is fantastically balanced. 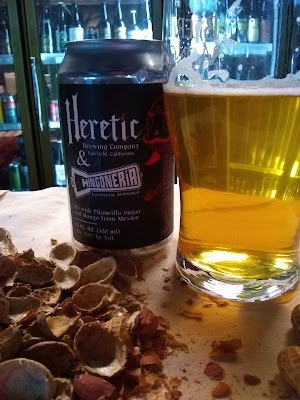 Heretic El Diablito - This was a beer that we were far more enamored with than our drinking buddies were. The 9% came across to us as pleasantly sweet (instead of cloying) and drinking dangerously crushable. As with their 12% Ecstasy barleywine, they seem to have the skill of "hiding" big ABVs in delicious drinkable packages. Now for the cider side of the list, starting with Bauman's Cider Company located in Gervais, OR (yeah, we had to look at a map, too, to find that it is about halfway between Wilsonville and Salem). These two ciders were a great introduction to them. Loganberry - Light berry in flavor with a beautiful color, it is effervescent and temporarily transports one to the warmer days of summer. Loganberries are one typically one of the first berries to ripen with the trade off that due to their delicate softness, they must be hand picked. We applaud Bauman's for using them despite that and hope to find more of this cider in our glass in the future. Clyde's Dry - Named for the cider maker's grandpa, this is a blend of 20 varieties of apples. What could have been a muddled, middling cider is in fact wonderfully complex and slightly funky. Carlton Cyderworks Summer Set - Located just down the road from Bauman's is Carlton Cyderworks in McMinnville. This is the third offering we've had from them, the others being a perry and their 2017 Willamette Week Pro/Am offering. A straightforward 50/50 blend of Dolgo Crab apples from Sunnyside, WA and Gravenstein apples from Wheatland Ferry, OR, it features a slightly funky aroma with a pleasantly tart flavor. We have been keeping our eyes open, and starting to do some stocking up, of beverages for the holidays in anticipation of the gatherings we'll be attending and hosting. It's a bonus that all the beers and ciders on this week's list are available in packaged/portable form. This week's best beers take us from breakfast to the beach. Fort George City of Dreams - Technically a pale ale, this 5.5% hazy beer makes a great accompaniment to a cup of coffee (trust us, that's how we started football Sunday). What it makes up for in visual appeal in the glass it more than makes up for in citrusy flavor, with an eye-catching label on the 12oz cans to boot. If a glass of hop juice is a little to much to start your day with, then this next beer is a great alternative. StormBreaker Mocabe Lo Sabe - A coffee cream ale made in collaboration with Groundwork Coffee it is smooth and creamy, thanks to the flaked oats. Also clocking in at a morning-appropriate 5.5%, coffee beer lovers should seek this out before it's gone. Breakfast behind us, grab a towel and let's head to the beach. Urban Family Island Crusher - A dry-hopped sour with pineapple and Amarillo hops, it starts with the aroma of freshly slathered on cocoa butter and the flavor follows with a pineapple/hop bite. Between the green and yellow of the label and the beer inside we dare you not to imagine being transported to the tropics. As we approach Christmas and the day drinking it likely entails, consider picking up at least one of these for yourself or to share. Remember, Santa sees all. The last month of the year, the holidays, things are getting busy on this end so this week's Best Things is a short but sweet two-beer list. Baerlic Woodworker Thunderbolt Bourbon & Pinot (2015) - Enjoyed while browsing the handiwork of local craftsmen and women, it would have been quite easy to sit down and enjoy a whole bottle of this 7.9% oatmeal porter aged in bourbon and Pinot Noir barrels. The bourbon characteristics were restrained, supporting the oatmeal porter base, with the Pinot barrels giving it a most lovely, slightly tart flavor. Mother Earth Hop Diggity - Clocking in at just a slightly higher ABV than the Woodworker, this is apparently Mother Earth's most popular Double IPA and we can see why. Starting out with a pleasant fruity-stanky aroma the flavor is just a hair lighter, making for a super easy drinking beer. Look for it in easily portable, highly visible 12-ounce yellow cans the next time you're peering in the door of the beer cooler at your favorite joint. Now, get moving. Get all those little errands done whenever you can and for gods' sake, get those cards and packages in the mail sooner than later! Because once it's done you can really settle in to enjoy some delicious beverages.